Welcome to redeft.ca. the website of artist Peter Sloan. Please explore the site to see examples of my work in Plaster, Bronze, Clay, Silver and gold. Ocarinas are my specialty: the ocarina is an ancient wind instrument that has been prized by many cultures for more than 12,000 years. 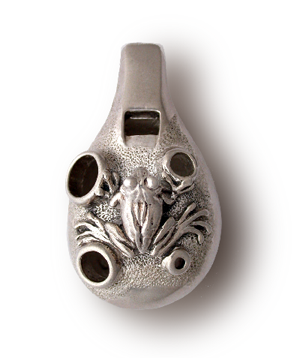 Silver Frog Ocarina - see silver ocarinas page.